I understand that not everyone gets my fascination with these barns. But with help from the Mail Barnstromers website, we realized that there were barns in Maryland not too far from us. So with no real plans for July 4th, we all of a sudden had a mission. Two of the barns we were looking for were in Carroll County. We drove up to Damascus, then headed north on Route 27. We were again following GPS coordinates, that we realized were imperfect. The first barn was supposed to be 3 miles north of where 27 crosses I-70. Drove 3 miles, nothing. Followed the GPS coordinates into a neighborhood a little further down. Nothing. Got back on 27 and about 2 miles later, we found it. 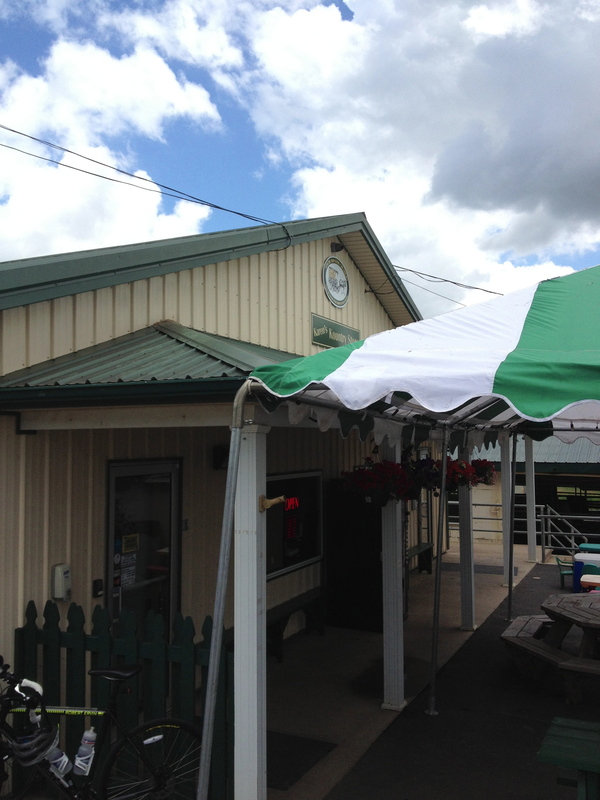 The next barn was further up Route 27, on the other side of Westminster, almost to the Pennsylvania border. We followed the GPS directions and didn’t see it. The Barnstormers website said it was just about a mile west of Route 30. So when we hit 30, we knew we went to far. There was a side street that we thought might lead to the barn. After turning off, we came upon a man on a riding mower. We stopped and asked him if he knew where the barn was. He said it was right at the end of that street. And after finding it, we realized that the faded paint is why we had driven right past it. The last barn was near Fredrick. The Barnstormers directions said it was right on I-70 near New Market. We drove past there and saw nothing. Again, we went for the side road, which in this case was Old National Pike. We had been looking for fresh corn, so we stopped when we saw Skeeters Produce. 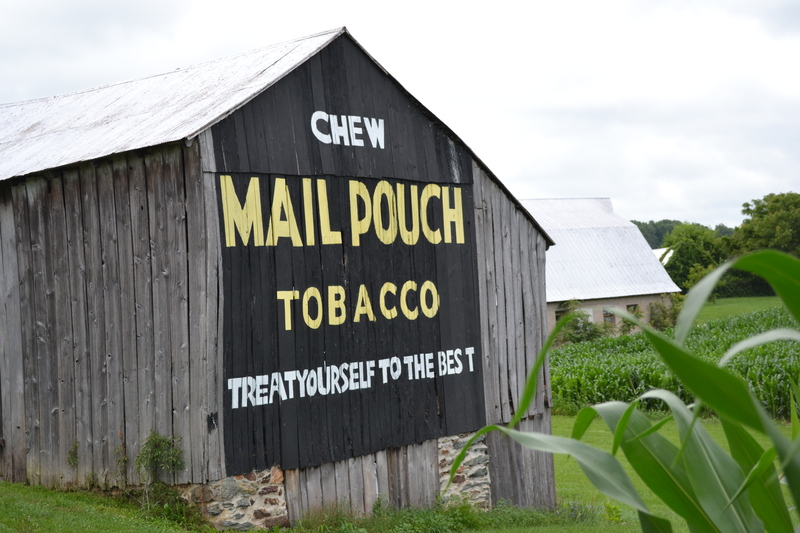 We asked the woman working there if she knew about a Mail Pouch barn nearby. She hadn’t heard of them. After I showed her a picture on my phone, she said it looked familiar but didn’t know. Not a mile further up the road, we found it. Now this is a shed that I think someone painted on their own. Nevertheless, it counts to us! We decided to be efficient, so we combined the barnstorming with our mission to again complete the Maryland Ice Cream Trail. So we continued to Middleton and visited the South Mountain Creamery. Last year, we visited it on a day when we did 3 ice creameries in one day, so we hadn’t appreciated it. Today, it was just South Mountain. And the ice cream was worth it! So I think we are done for the time being with Mail Pouch barns. Next time we go to Pittsburgh we might try to find a few more along the way. I can’t describe the rush when we locate one, it is a thrill to find these since it isn’t so easy. But well worth it. 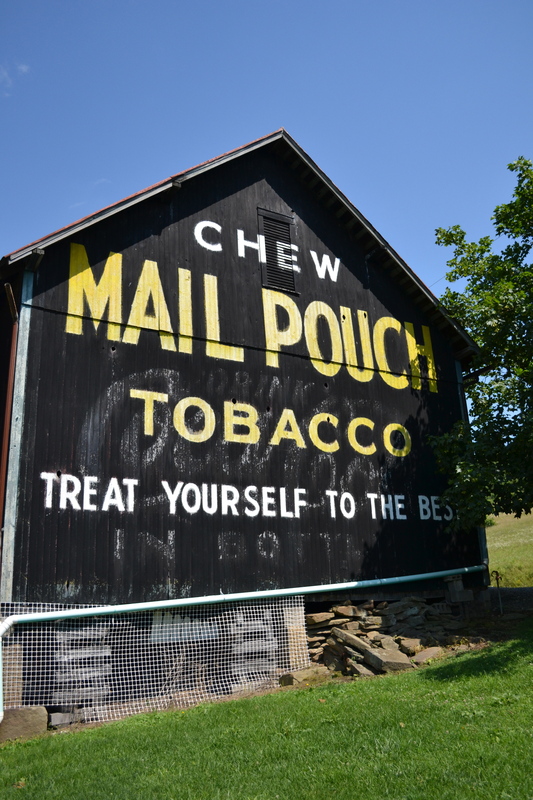 We drive to Pittsburgh often, and pass two Mail Pouch Barns off the Turnpike. 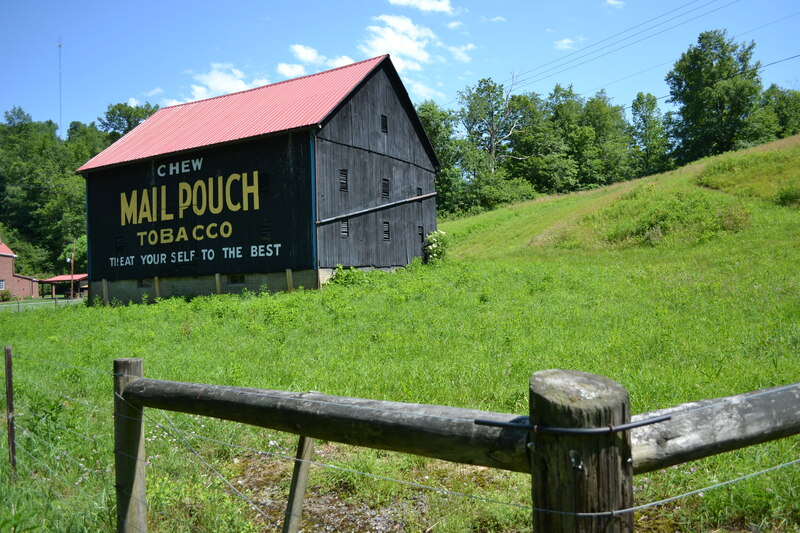 We stopped to photograph the one in Mann’s Choice before, but decided to combine this weekend’s visit to Pittsburgh with an extended trip to see Mail Pouch Barns. 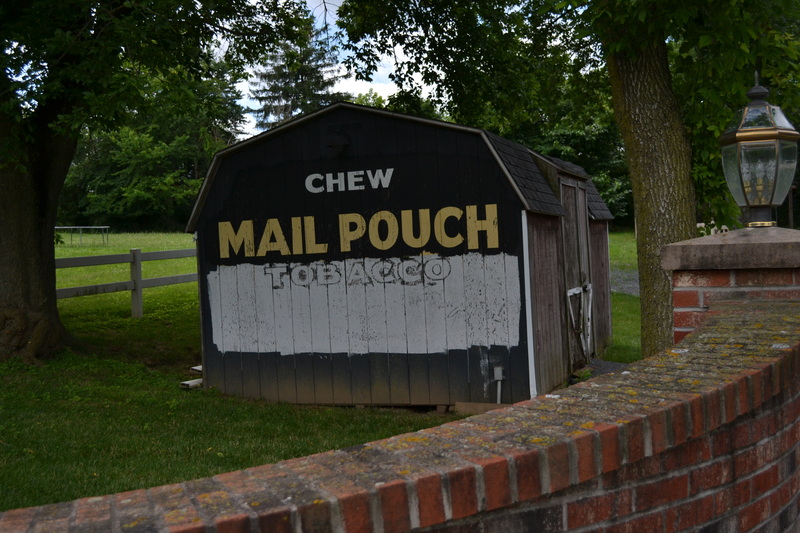 For those unfamiliar, there were once over 20,000 barns painted with advertisements for Mail Pouch Tobacco. Spread throughout many states, they were concentrated in Ohio and Pennsylvania. The Highway Beautification Act banned billboards along US highways, but grandfathered in existing ads. As part of this trip, I photographed 6 barns. We started on the way to Pittsburgh with the barn in Buffalo Mills, PA. There are no local roads near the barn, so the only way to photograph it is to stop along the Pennsylvania Turnpike. This is something I only wanted to do once. Luckily, I was able to quickly pose cows in front of the barn. After visiting my in-laws, we drove on Saturday to Waynesburg, PA in Greene County. Near the West Virginia border, Greene County is home to many barns. We had found several websites, the best being Mail Pouch Barnstormers with details of where to find barns. Armed with exact latitudes and longitudes, I thought locating them would be easy. It wasn’t. We plugged in coordinates into our GPS, but often found nothing when we got to the location. Instead, we depended on our keen sense of sniffing out where a Mail Pouch Barn might be, staying mainly to main roads, where advertising would obviously reach more eyeballs. You had to look on all sides of a barn, so a quick look as you passed barns was required to find some of them. We had driven about 6 miles out of Waynesburg, using coordinates that we had. 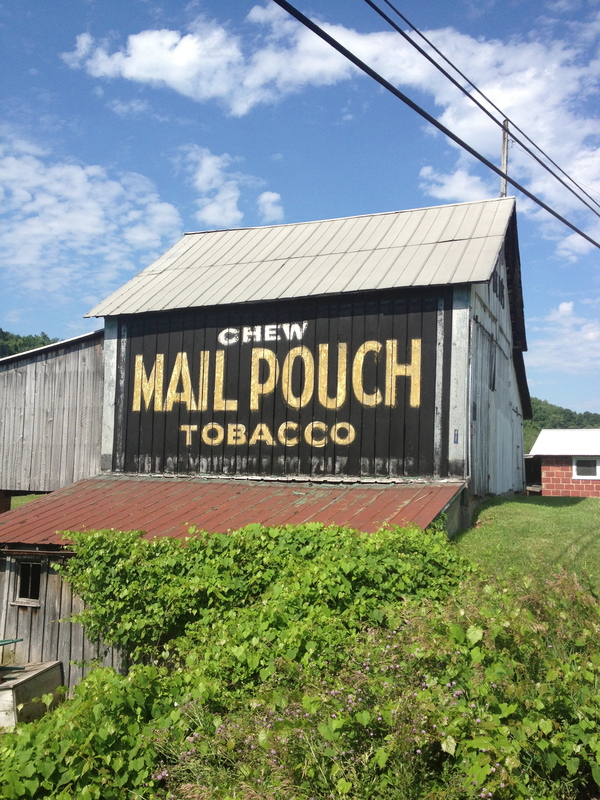 We didn’t find one there, but soon drove past a Mail Pouch barn on Washington Road in Waynesburg that was in great condition. 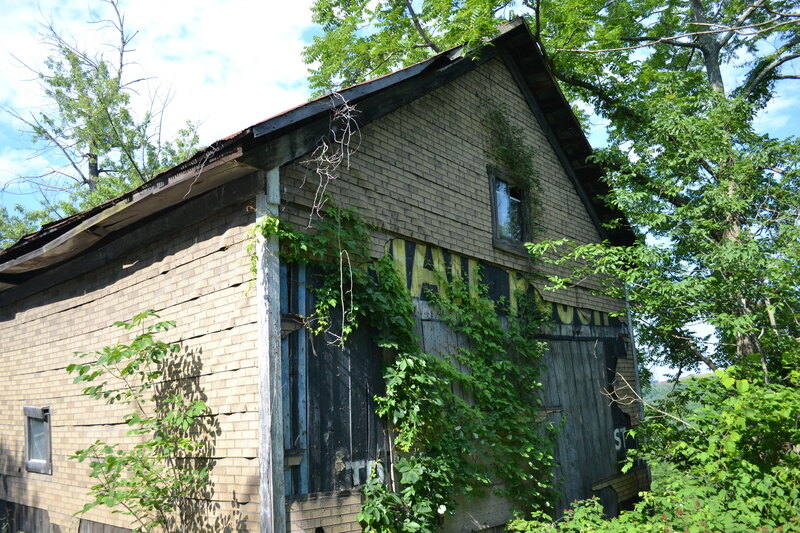 The second one we stumbled upon was at 418 Washington Rd, Waynesburg, PA. It was in poor shape, but you could clearly see the Mail Pouch paint on wood that had since been partially covered up. Plugging in another set of coordinates, we headed into Carmichaels, PA. We passed a barn, and saw on the hidden side was a nicely painted barn! So 1794 Roy E. Furman Highway brought us this beauty. Following another set of coordinates, we followed the GPS until it brought us to a gravel road off of Route 19 that led to a coal shaft. At first, I gave up and turned around. After driving maybe a mile, I said to Ellen that if there was a barn, it was more likely to be just off the highway, so maybe we hadn’t gone far enough. So we reversed course and drove to 1657 Mt Morris St, Waynesburg, PA. Here we found my favorite of the 6 we saw. 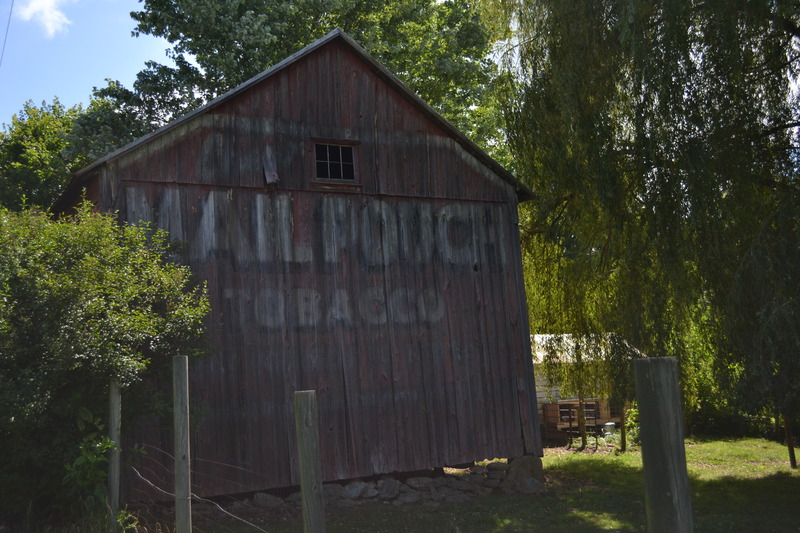 The Mail Pouch barn was adjacent to a softball field and just a few feet off the road. You could walk right up to it. 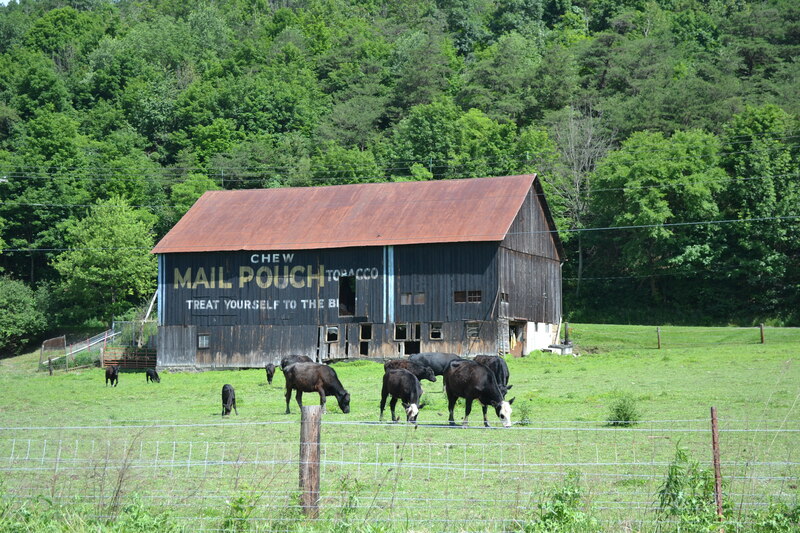 What made it best was that it had Mail Pouch painted on both sides of the barn. Pleased with myself for the sixth sense that had caused me to turn around, we headed south on US 19 towards West Virginia. I considered the day a complete success, but Ellen wanted to locate an even 5 barns today. So after again going on a goose chase following coordinates we kept going on 19, and in Mt. Morris, we found our last barn of the day. Once we entered West Virginia, we didn’t see much farm land along US 19, and decided to get on I-68 towards home. Ellen was perusing the Mail Pouch Barnstormers web site, and saw that there are barns in Maryland. We stopped at a Maryland welcome center to ask. At first the two women behind the desk gave a quizzical look when asked about Mail Pouch barns, but after I showed them a picture on my phone, they immediately detailed ones nearby. We set out to find one off exit 22 of I-68 on US Alt 40 in Maryland, but didn’t seem to locate it. There reportedly are barns in Frederick, so we are planning to use July 4th to try to find them. I’m not sure what it is about the barns that captivates me. Maybe it is the marketer in me who appreciates using barns as advertising billboards. 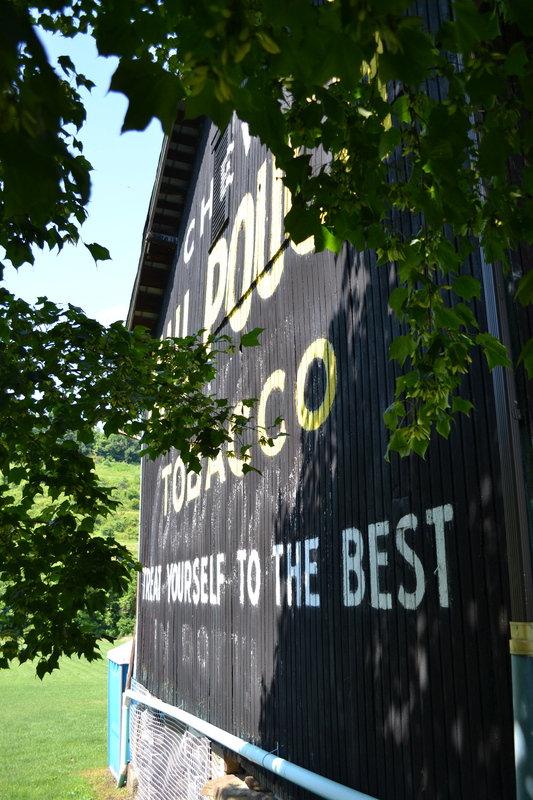 It could be the purity of the ads, black backgrounds painted on red barns with simple white and yellow lettering. I’m sure some if is the nostalgia of an age that predates me, where driving was done on roads where you were close enough to farms to see the barns. 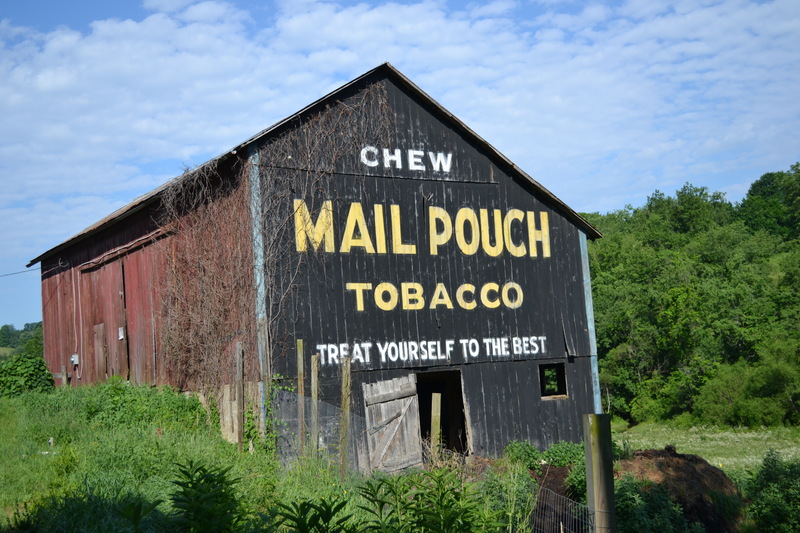 I’m thankful for the two barns still on the Pennsylvania Turnpike, that led me to know about and appreciate the beauty of Mail Pouch barns.